If you haven't listened to the 2016 Centy Awards podcast yet, you can read our thoughts in today's post. Chad and I started doing the awards in 2011 as a way to honor (and ridicule in some cases) the men, women, and storylines in the world of professional wrestling. Kevin's pick: Charlotte Flair. Picking a female as Wrestler of the Year is a first here at the Centy Awards. Charlotte has proven she's one of the greatest with her four championship wins since joining the main roster in 2015. Her undefeated singles streak on pay per view is something we've never seen before either by a man or woman. Kevin's pick: Inconsistency. First, it was with the Shane McMahon-Undertaker match. Shane lost and was supposed to disappear from WWE. Now he's the Commissioner of SmackDown Live! I have no problem with that, but why have the stipulation in the WrestleMania match? Also, when are we gonna get the scoop on Triple H helping Kevin Owens win the Universal Championship? Kevin's pick: Kevin Owens. I don't mean by fans, I think WWE is underappreciative of the current Universal Champion. He seems to be in the shadow of Chris Jericho, Seth Rollins and Roman Reigns. I'd love to see a couple of convincing title defenses. But over the next few years, he'll continue to grow in WWE and be one of the all-time greats. Kevin' pick: GOLDBERG. This isn't so much a slam against Goldberg as it is WWE writers. When Michael Cole called Goldberg "the greatest champion in WCW history" didn't sit well with me. Kevin's pick: "Broken" Matt Hardy. See Chad's description for why he picked Hardy as Wrestler of the Year. I just wish TNA would monetize and pretty promote this storyline/character. It's always been their downfall. Kevin' pick: SummerSlam. AJ Styles vs. John Cena stands out to me on this show. It's what made AJ a SUPERSTAR. Yes, he was great before that, but now he's truly hanging with the GOATs. Finn Balor and Seth Rollins had an outstanding match as well as Charlotte and Sasha Banks. Kevin's pick: Renee Young. An unconventional pick, but I think Renee is one of the most underutilized talents in wrestling. She does a great job on Talking Smack, the pre-shows and WWE's Snapchat. I'd love to see her join one of the commentary teams in the next year or two. Chad's pick: Crummles & Defarge are names few people are probably familiar with right now. They are a new tag team who showed up during Season 16 of Chikara. Their gimmick is old-timey beggar/chimney sweeps though they don’t carry brooms. They’re different from WWE’s old-timey team the VaudeVillians. 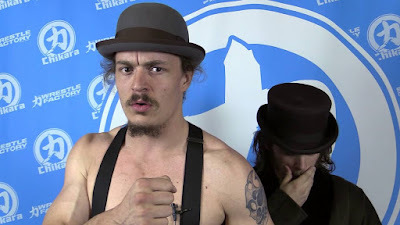 While they haven’t lit the Chikara tag team scene on fire yet, give them a couple years of seasoning and I see big things in store for the team. Kevin's pick: Eva Marie. I guess I'm seeking heat for this pick. Since I named Charlotte Wrestler of the Year, I went with Eva Marie for Female of the Year. Her reasoning for not getting into the ring each week was one of the most entertaining storylines of summer. I hope she's back in the ring sooner rather than later. Chad's pick: Charlotte. Undefeated in singles matches on Network Specials. 37 Time Women's champion. Enough said. Kevin's pick: Conrad Thompson (@HeyHeyItsConrad). 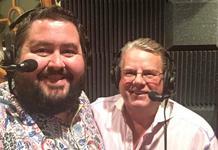 Conrad is the co-host of The Ric Flair Show and Something to Wrestle with Bruce Prichard. I had the pleasure of interviewing him for the My 1-2-3 Cents podcast earlier this year. Conrad interacts with listeners of his shows on Twitter like no one I've seen before. He's a great guy too as he and Bruce raised money for the American Cancer Society. I can't say enough good things about Conrad and Bruce and their show. Kevin's pick: Rusev. 2016 was an up and down year for the Bulgarian Brute. League of Nations could have been a great thing, but the concept fell flat. Then he regained the U.S. Championship and had a decent run until crossing paths with Roman Reigns. Here's to hoping 2017 sees Rusev climbing back to near the top. 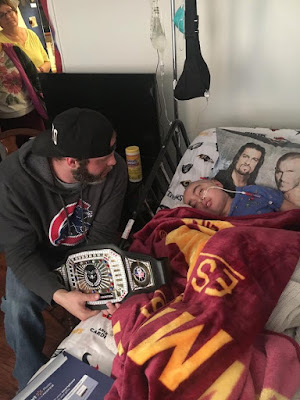 Chad's pick: My wrestling fandom. While I watch RAW, Smackdown, Impact, Lucha Underground on a weekly basis and the monthly Chikara shows when they are posted on Chikaratopia, I don’t pay that close attention to the shows. I couldn’t tell you why Randy Orton is a member of the Wyatt Family. Don’t know the majority of the story lines in Lucha Underground. I enjoy the shows but there’s something about wrestling today that just doesn’t stick with him an hour after a show is over. All Out of Bubblegum Award is something I came up with earlier this year to honor the memory of "Rowdy" Roddy Piper. It goes to someone who has displayed courage, bravery and determination outside wrestling storylines. This year the award goes to Heath Hatton from Stride Pro Wrestling. He is a friend of mine and has gone above and beyond to make a difference in the lives of others. Heath has put in countless hours on benefit shows and traveled to visit Dalton about a week before he died. He's an all-around good guy and a great performer in the ring. Do you like our picks? Who would you award in 2016? Share your thoughts here or on Facebook.